Heaven & Hell is a compilation album by American singer Meat Loaf and Welsh singer Bonnie Tyler. It was released in 1989 by Telstar Records. The majority of songs included on Heaven & Hell were written by Jim Steinman, who wrote some of Meat Loaf and Tyler's biggest hits. Meat Loaf's tracks come from Bat Out of Hell (1977), Dead Ringer (1981) and Midnight at the Lost and Found (1983). Tyler's tracks come from Faster Than the Speed of Night (1983) and Secret Dreams and Forbidden Fire (1986). Though the album was not an immediate commercial success, due to steady sales Heaven & Hell was certified platinum by the BPI in 2013 for sales of over 300,000 copies. Thom Jurek of AllMusic described the compilation as "a rather pointless collection of tunes", only that it was "a good idea at the time". He described Steinman's songs as "brilliantly composed" and Meat Loaf's vocals as "wonderfully sung". 11. "If You Really Want To"
12. "Straight from the Heart"
In the UK, the album was released with different cover art and a different track order. Two of Meatloaf's tracks, "If You Really Want To" and "Heaven Can Wait", are also omitted in favour of two other tracks: "Rock N' Roll Mercenaries" and "Modern Girl". The label for this release was Telstar Records PLC. "Have You Ever Seen The Rain"
"Loving You's A Dirty Job But Somebody's Got To Do It"
^ a b Jurek, Thom. "Heaven & Hell - Meat Loaf / Bonnie Tyler — Songs, Reviews, Credits, Awards". AllMusic. Retrieved 7 April 2015. ^ "Australiancharts.com – Meat Loaf & Bonnie Tyler – Heaven & Hell". Hung Medien. Retrieved 7 April 2015. ^ "Meat Loaf and Bonnie Tyler | Artist | Official Charts". UK Albums Chart. Retrieved 7 April 2015. ^ "British album certifications – Bonnie Tyler – Heaven & Hell". British Phonographic Industry. Retrieved 7 April 2015. Select albums in the Format field. Select Platinum in the Certification field. Type Heaven & Hell in the "Search BPI Awards" field and then press Enter. 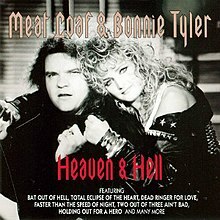 ^ a b "iTunes — Music - Heaven & Hell by Meat Loaf & Bonnie Tyler". iTunes Stores (UK). Apple, Inc. Retrieved 7 April 2015. This page was last edited on 18 October 2018, at 23:26 (UTC).